Featuring New Streams 7 Software – Stated simply, IO Industries Streams™ 7 is designed to handle all of the data recording requirements for an application. 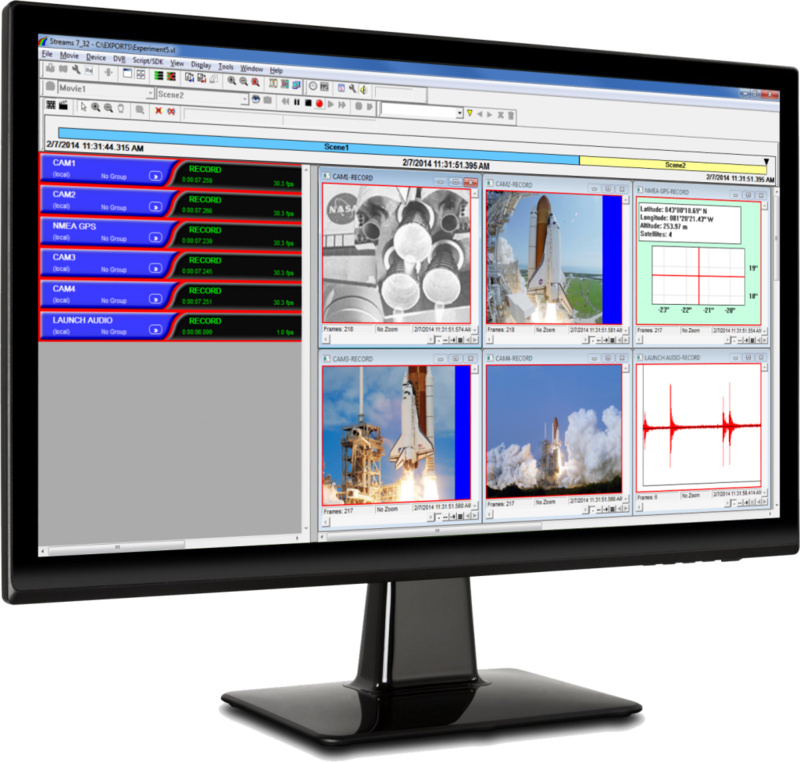 Whether your needs are to record a single video camera in the lab, or 15 high-speed cameras at a rocket launch, Streams 7 has the capability. But Streams 7 is about much more than video recording. It provides simultaneous data recording from a variety of streaming devices, synchronizing these data streams using computer time, GPS time, or IRIG-B time. This makes Streams a perfect match for apps such as airborne recording systems, where requirements often extend to recording data from multiple cameras, a GPS receiver, an altimeter, and a navigational instrument. The Streams 7 user interface provides independent controls, operating status, and data viewing for each device in a consistent manner. Data can be viewed as instantaneous, time series, or as numeric text for each device type, which in the case of a video stream, corresponds to single frame, thumbnail sequence, and pixel values. Recording can be started and stopped using a variety of hardware and software triggering methods. Timing methods range from static frame rate control to variable timing control using programmable scripts. Events of interest can be marked during or after recording for quick reference. Data management tools safeguard your data, while providing convenient access to recordings for playback and analysis.